I get a quarterly magazine from Sherwin-Williams called Stir. Stir is dedicated to the study of color and it's usually well worth the read when it arrives. 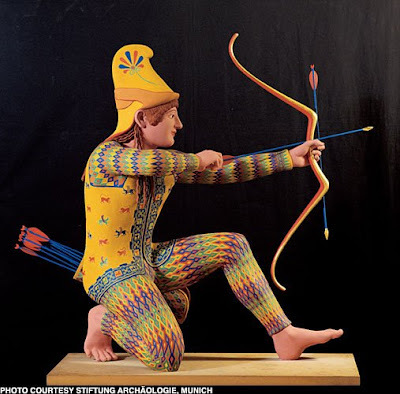 The latest issue landed on my desk this week and on its cover was an image of a brilliantly painted statue of an ancient Greek archer. Here's the image that was on the cover. I dove right and and I learned a thing, several things in fact. My comment yesterday about art history being your friend is true, true, true; and never more so when somebody figures something out that upsets the apple cart. That image is from a museum exhibit that's been making the rounds for the last couple of years. You can read more about it on a site called Archeology, a publication of the Archeological Institute of America. Now, I always knew that a lot of Greek and Roman sculpture was painted. But that was always theoretical, none of the sculpture in question still had its original colors intact. The ancient Greeks and later, the Romans, made paint from finely ground pigments in an organic binder. Over the course of the last couple thousand years, those binders have broken down and the original colors have dissolved. All of that color information was lost to time. Or so I always thought. 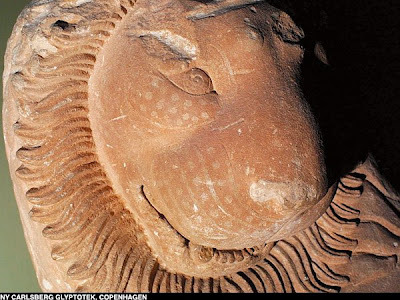 Vinzenz Brinkmann, formerly a curator at the Glyptothek Museum in Munich, has spent the last 25 years of his life pouring over ancient statues and looking for traces of their original colors. Once he found evidence of color, he researched the pigments that would have been available at the time of the piece he was studying. He'd then recreate the piece he was studying and make it appear how it would have originally. 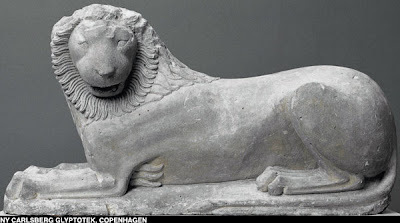 Recreated ancient sculpture that would have looked familiar to an ancient Greek or Roman. Cool! So take a look at the archer up there and notice the pattern of his leggings. They're kind of hard to miss now but here's a scanned image of what Brinkmann started with. That's his thigh, and you can make out the pattern pretty well. Going from the image directly above to the fully realized, richly painted archer at the top of this post is an act of studied bravado that really thrills me. Pretty cool stuff. But wait, it gets better. Here's a colorized Greek bas relief. And here's the scan it started with. 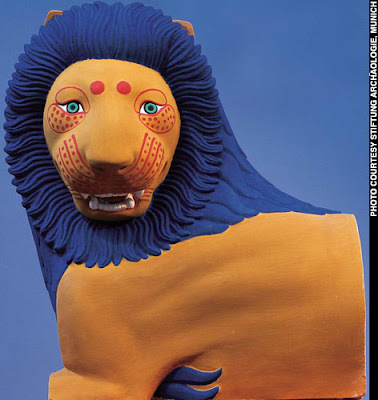 Here's a Greek lion that I think is really cool. I was familiar with it as a color-less stone sculpture, but to see it in authentic period colors really fires up my imagination. Check out the detail that's carved into its face. And finally, here's how it would have looked to someone almost 3000 years ago. This stuff's fascinating to me. I love the opportunity to reach back through time and see the world in a way similar to how it would have appeared to ancient people. Homo sapiens hasn't really changed much since we evolved as a species and the need to decorate with color seems to be something we're hard wired to do. Western civilization stands squarely on the shoulders of these ancient people and it's a fulfilling thing to find these threads that extend back through time. Looking at these colorized sculptures made me think of something else too. The Renaissance got a ball rolling that's still rolling. That ball is the value placed on knowledge and learning. Prior to the rebirth of making knowledge a priority, the Renaissance started out as an artistic style. The Medici of Florence wanted to reclaim the glory of Rome and they started with art and architecture. Michelangelo, DaVinci, Bernini, Raphael, Titian and all the great names from the Italian Renaissance studied the forms and styles of ancient Rome and Greece. Then they recreated it in Siena, Florence, Venice and Rome. The Renaissance was the original revival movement. Since these guys studied the ruins and remains of Greece and Rome, the sculpture they saw was white marble, sans paint. 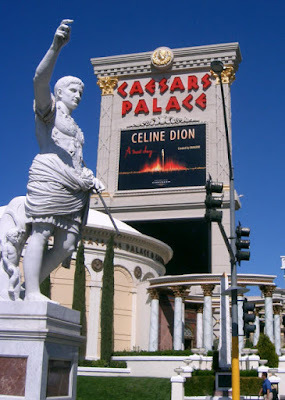 Here's an example that uses a bust of Caligula. The background image is what you'd expect a Roman bust to look like. The image in the foreground is what a Roman would have seen. 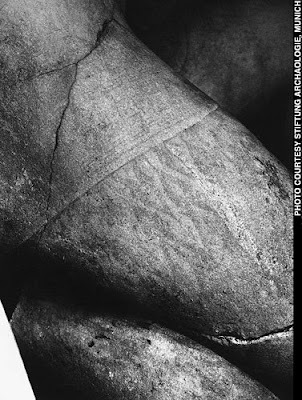 Michelangelo's David is in white marble because Michelangelo Buonarroti didn't know the classical Greek and Roman forms he studied were painted originally. Hmmm. 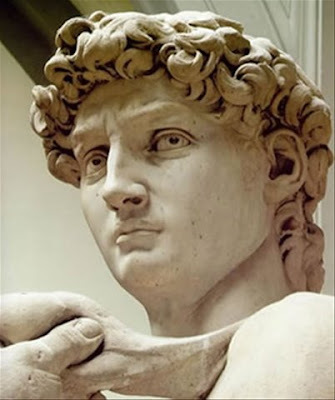 Michelangelo's David is a masterpiece in every sense of the word, but imagine how different things would look today if the Renaissance masters knew about the colors the ancients used. And had the Renaissance masters not missed the color thing, imagine how tasteful this would be with a fluorescent color scheme. Great post, have a great Easter! What an excellent post. I am so used to seeing these things without color, that it never ocurred to me that they once might have been painted. And why wouldn't they have been? This puts a whole new spin on ancient art for me. This whole body of research has fired up my imagination in ways I have difficulty describing. The great awakening of the Renaissance continues to this day and how that Renaissance looked and looks is based on partial information. Wow! I find the wall friezes in Pompeii and Herculaneum fascinating in the same way. Thanks Kelly. One of the coolest things about seeing Pompeii and Herculaneum in person is that so many of the friezes and frescoes are preserved with enough of their original color in them that you can really get a feel for how bright and colorful the ancient world was. Break a CFL? Don't panic. How would you like to win a Blomberg dishwasher? Reader question: Can I paint tumbled marble?